Alright, who's ready to kick off another Army football season? We've all waited plenty long enough and the 2016 college football season is mere weeks away. 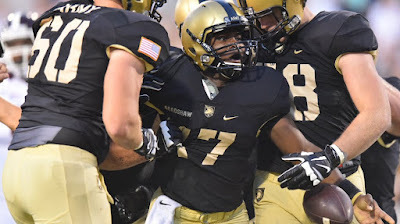 Ahmad Bradshaw escaped Chicago to play football at west point... then escaped West Point to go back to Chicago... and now has abandoned his flight to remain as the QB at West Point. I don't know the specifics of why Bradshaw left the team, but it would have been a huge blow to Army's depth at QB. Having a capable backup is crucial and losing any of the quarterbacks at this point would have been disastrous. It comes as a reminder that Army needs 2 capable backups for any given season. If QB Chris Carter was pressed into the starting role his presumptive backup Malik McGue would need to be ready to play. Thankfully Bradshaw stays and I have stopped hyperventilating. It would have been pretty much the worst time to lose your top guy, but as it is it's just a reminder of how things can spin out of control very quickly. With any luck I will keep up with the season and post somewhat regularly.